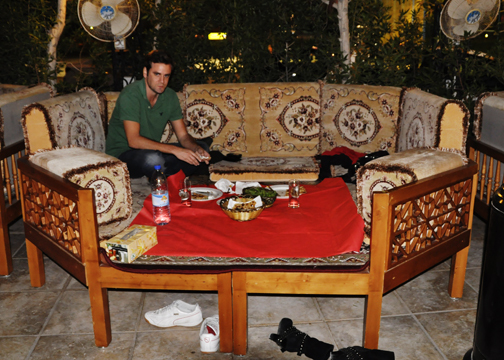 I’m sad to say I’ve had fairly blah – bad experiences with Iranian food here in Dubai. That’s not to say I’ve tried a lot of Iranian food here, but the little I did try during my first year was so unimpressive I never really bothered with it again. 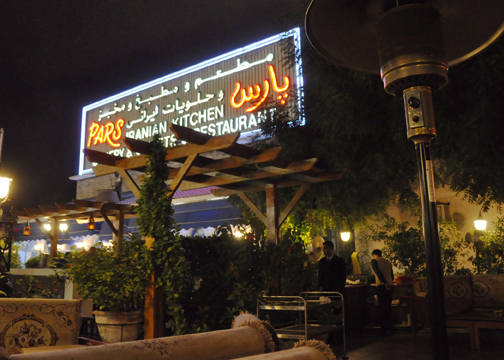 I had heard that there was a very good Iranian grill, by the name of Pars Iranian Kitchen, that was absolutely worth a try. It was a while back that it was originally recommended to me, and even though it is located in my neighborhood (in Satwa, it’s near the Satwa roundabout and Rydges) within easy walking distance of my flat, I never got around to actually making it there. So…I finally made myself go there last night for a nice end-of-week dinner. Quite glad I finally did, too! It was such a pleasant experience. 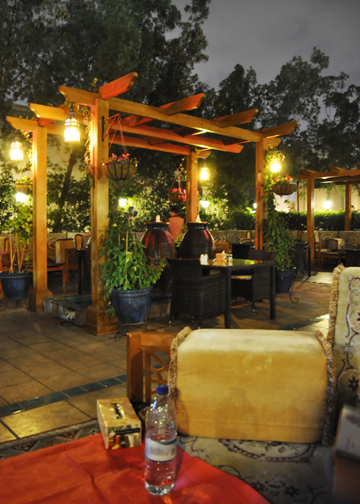 With the tables and majlis seating located outside, it’s not somewhere that would be half so pleasant in summer, so mid-winter was really an excellent time to finally decide to go. All (from what I could tell) outdoor, you are given of choice of normal (for westerners) table seating or the more traditionally Arabic styled majlis seating. I went for the majlis seating because it looked more comfortable, despite well knowing that I would just end up dropping food all over myself and the seating (and I did not disappoint in that area). Dark, surrounded by tall trees, with a small pool/water feature in the middle of the dining area, the seating/dining area was really quite chilled-out, even though busy, loud Diyafah St is literally right there. The food was pretty good. VERY nice Arabic bread, good fresh juices, fattoush (a type of Arabic salad) was decent, but I’ve had better; Al Mallah (down the street) has a tastier, tangier version. The meat was the highlight, definitely. 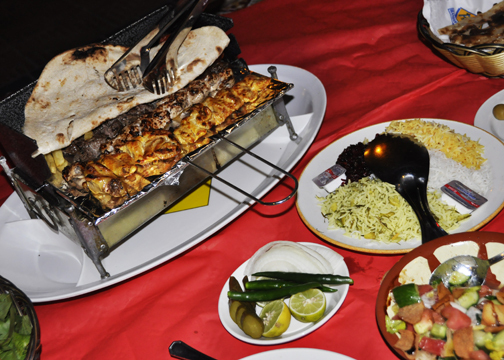 We ordered a mixed grill for 2 people and when it was ready, a small grill with the skewered meats, as well as some french fries and grilled tomatoes, was placed at our seating with a few different types of simply-prepared rices. The meat included the usual minced beef and lamb skewers as well as chicken, and each type was very tasty. Lots of flavor and the meat quality was generally quite good. All in all, a nice place. It’s a shame I didn’t make it there sooner, but I will definitely return in the future. The menu had a good deal of delicious-looking options.